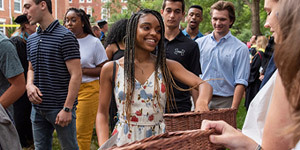 The University’s 6,196 undergraduates enjoy the benefits of an arts and sciences university, forming strong bonds with faculty and staff mentors. The four-year graduation rate of 81% ranks in the top 7% of more than 1,500 US colleges and universities. Elon is one of only seven private universities in the US with accredited schools of Business, Communications, Education, Law, and Health Sciences, plus a chapter of Phi Beta Kappa, the nation’s oldest and most prestigious academic honor society. Elon sends more undergraduates to study abroad than any other master’s-level university in the nation. Seventy-eight percent of graduates have at least one international study experience, often combined with internships, research, or service. In addition, Elon’s Study USA program includes opportunities to study in Los Angeles, New York City, San Francisco, and other US locations. The University’s four-year Engineering program provides a blend of rigorous engineering courses with a strong foundation in the arts and sciences. This distinctive approach produces graduates who are in high demand in the profession. An Elon education is filled with hands-on learning in the classroom, in the lab, and on the job. As a result, 89% of students complete internships, 49% of students hold at least one campus leadership position, and 23% of students work with faculty mentors on undergraduate research projects. Students live in eight distinct residential neighborhoods designed for various stages of their college career. The goal is to create a seamless academic, cocurricular, and residential experience that engages students throughout their time at Elon and beyond. Elon leads the nation in the 2019 U.S. News & World Report ranking of academic programs that “focus on student success.” U.S. News & World Report also ranks Elon #1 among southern master’s-level universities, with #1 rankings for undergraduate teaching and innovation. In addition, Elon is included in the ranking of the nation’s best undergraduate Business programs. The Princeton Review ranks Elon among the nation’s 382 Best Colleges and the #1 “best-run college.” Kiplinger’s Personal Finance magazine names Elon one of the nation’s “best value” private universities. Elon’s historic 656-acre campus incentral North Carolina is designated as a botanical garden and includes the 56-acre Elon University Forest, a land preserve and natural area for scientific research, and Loy Farm, a center for environmental research and sustainability that includes a solar farm. Elon is a member of the Colonial Athletics Association. The Phoenixes compete in 17 intercollegiate men’s and women’s sports in NCAA Division I (FCS football). In addition, Elon offers 18 intramural and 21 club sports. The best way to experience Elon is to see it yourself! Go to elon.edu/visit to schedule a visit. For application information, visit elon.edu/apply.